My high school friend and facebook buddy, Chad posted a recipe last week. 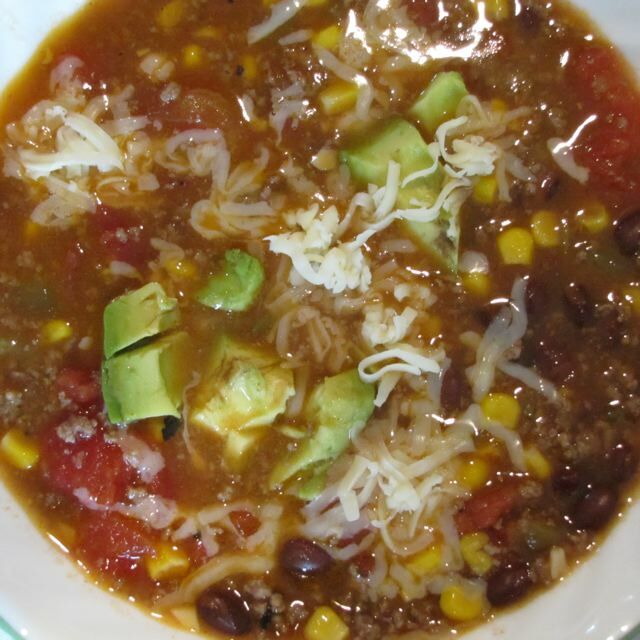 Simple Taco Soup from allrecipes.com. I made it and improved on it a little. thought I would share. It is easy to make. My son, who is 8 years old kept going back for more – I think in the end he had 4 bowls of the soup! Changes I made: I added chopped garlic to the meat browning process, used chicken broth (and more of it) instead of water, used roasted peppers and a can of green chilies instead of the tomato/green chili combo, and black beans instead of chili beans.. so basically it was nothing like the original in the end, but it was very good!! I topped the soup at the table with freshly sliced avocado and Monterey Jack cheese. Thanks for sharing Chad! Heat a large saucepan over high heat. Brown the ground beef and season with salt and garlic toward the end of he cooking time. Drain. Add remaining ingredients. Heat through over medium high heat. Serve. Top individual servings with cheese, avocado or sour cream if desired, but the soup will be tasty without as well. Categories: Ethnic, Ethnic - Mexican, Main Dish, Main Dish - Soups | Tags: Taco Soup | Permalink.